Surface tension in water might be good at performing tricks, such as being able to float a paper clip on its surface, but surface tension performs many more duties that are vitally important to the environment and people. Find out all about surface tension and water here. Surface Tension: "The property of the surface of a liquid that allows it to resist an external force, due to the cohesive nature of its molecules." It seems to defy the laws of physics, but a paper clip made of steel can indeed float on the water surface. The high surface tension helps the paper clip - with much higher density - float on the water. The cohesive forces between liquid molecules are responsible for the phenomenon known as surface tension. The molecules at the surface of a glass of water do not have other water molecules on all sides of them and consequently they cohere more strongly to those directly associated with them (in this case, next to and below them, but not above). It is not really true that a "skin" forms on the water surface; the stronger cohesion between the water molecules as opposed to the attraction of the water molecules to the air makes it more difficult to move an object through the surface than to move it when it is completely submersed. (Source: GSU). The cohesive forces between molecules in a liquid are shared with all neighboring molecules. Those on the surface have no neighboring molecules above and, thus, exhibit stronger attractive forces upon their nearest neighbors on and below the surface. Surface tension could be defined as the property of the surface of a liquid that allows it to resist an external force, due to the cohesive nature of the water molecules. Surface tension in water owes to the fact that water molecules attract one another, as each molecule forms a bond with the ones in its vicinity. At the surface, though, the outmost layer of molecules, has fewer molecules to cling to, therefore compensates by establishing stronger bonds with its neighbors, this leading to the formation of the surface tension. Within a body of a liquid, a molecule will not experience a net force because the forces by the neighboring molecules all cancel out (diagram). However for a molecule on the surface of the liquid, there will be a net inward force since there will be no attractive force acting from above. This inward net force causes the molecules on the surface to contract and to resist being stretched or broken. Thus the surface is under tension, which is probably where the name "surface tension" came from. (Source: Woodrow Wilson Foundation). Due to the surface tension, small objects will "float" on the surface of a fluid, as long as the object cannot break through and separate the top layer of water molecules. When an object is on the surface of the fluid, the surface under tension will behave like an elastic membrane. Water striders are able to walk on top of water due to a combination of several factors. Water striders use the high surface tension of water and long, hydrophobic legs to help them stay above water. Water striders use this surface tension to their advantage through their highly adapted legs and distributed weight. The legs of a water strider are long and slender, allowing the weight of the water strider body to be distributed over a large surface area. The legs are strong, but have flexibility that allows the water striders to keep their weight evenly distributed and flow with the water movement. Hydrofuge hairs line the body surface of the water strider. Walking on water: Small insects such as the water strider can walk on water because their weight is not enough to penetrate the surface. Floating a needle: A carefully placed small needle can be made to float on the surface of water even though it is several times as dense as water. If the surface is agitated to break up the surface tension, then needle will quickly sink. Don't touch the tent! : Common tent materials are somewhat rainproof in that the surface tension of water will bridge the pores in the finely woven material. But if you touch the tent material with your finger, you break the surface tension and the rain will drip through. Clinical test for jaundice: Normal urine has a surface tension of about 66 dynes/centimeter but if bile is present (a test for jaundice), it drops to about 55. In the Hay test, powdered sulfur is sprinkled on the urine surface. It will float on normal urine, but will sink if the surface tension is lowered by the bile. Surface tension disinfectants: Disinfectants are usually solutions of low surface tension. This allow them to spread out on the cell walls of bacteria and disrupt them. Soaps and detergents: These help the cleaning of clothes by lowering the surface tension of the water so that it more readily soaks into pores and soiled areas. Washing with cold water: The major reason for using hot water for washing is that its surface tension is lower and it is a better wetting agent. But if the detergent lowers the surface tension, the heating may be unnecessary. Why bubbles are round: The surface tension of water provides the necessary wall tension for the formation of bubbles with water. The tendency to minimize that wall tension pulls the bubbles into spherical shapes. Surface tension and droplets: Surface tension is responsible for the shape of liquid droplets. Although easily deformed, droplets of water tend to be pulled into a spherical shape by the cohesive forces of the surface layer. Below are other science topics associated with surface tension and water properties. Looking at water, you might think that it's the most simple thing around. Pure water is practically colorless, odorless, and tasteless. But it's not at all simple and plain and it is vital for all life on Earth. Where there is water there is life, and where water is scarce, life has to struggle or just "throw in the towel." Continue on to learn about dozens of water properties. Adhesion and cohesion are important water properties that affects how water works everywhere, from plant leaves to your own body. Just remember... Cohesion: Water is attracted to water, and Adhesion: Water is attracted to other substances. Below are publications relating to surface tension and water properties. 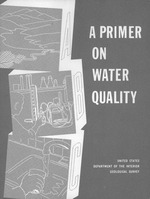 A primer on water quality; 1965; USGS Unnumbered Series; GIP; Swenson, H. A.; Baldwin, H. L.
Surface tension allows a water strider to "walk on water"